A version of this article appears in Artnet News with the headline: Never-Before-Seen Paintings by Kurt Cobain Will Get Star Treatment at the Seattle Art Fair. Artwork by former Nirvana frontman Kurt Cobain will be front and center at next month’s Seattle Art Fair (August 3–6). The never-before-seen paintings will be presented by the fine arts division of the United Talent Agency. This marks the first time the division, which launched in 2015, has participated in an art fair. 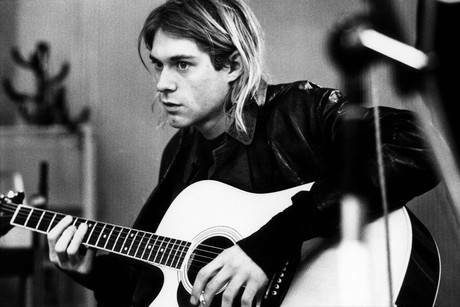 Cobain’s paintings, which will be shown alongside some of his notebooks, have been in storage since his death in 1994. Dozens of other paintings and drawing-filled notebooks remain in the estate, which UTA began to represent last year. UTA has long represented Cobain’s widow Courtney Love, and Roth says he has gotten to know her in recent years. With this new art-fair project, UTA further blurs the line between Hollywood talent agency and traditional gallery. Last year, UTA opened its own gallery space in Boyle Heights to mount creative projects with artists, including Enoc Perez, Jake & Dinos Chapman, and Larry Clark. Meanwhile, another division of UTA is working on a feature film about Cobain, and Roth hopes to mount a complementary touring exhibition. He cites the major Rolling Stones touring show “Exhibitionism” as a model to emulate, noting that ideally the show would start or conclude in Seattle.